Spencer Pigot's crash in practice Wednesday afternoon provided the Verizon IndyCar Series with its first look at how its new-for-2016 safety devices worked, and so far, everyone is pleased. Through its preliminary investigation of the Rahal Letterman Lanigan Honda driver's spin and collision with the Turn 1 wall, the rookie rotated, turned backward while heading toward the barrier, had the rear beam wing flaps deploy upward, poured tire smoke off his four Firestones, clouted the wall with the left-rear corner, and never looked close to flipping or flying. The combination of the mandatory dome skids beneath all cars that helps the floors to produce extra downforce in a spin, and the rear beam flaps that spoiled lift-producing airflow over the back of the car (while adding a lot of rear downforce) validated everything IndyCar's competition team has been developing since three cars crashed and flew at Indy 12 months ago. 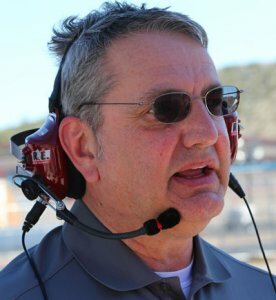 "We're quite happy to see a lot of tire smoke; we didn't see a lot of that last year, " Tino Belli, IndyCar's director of aerodynamic development told RACER. "We think that was the dome skid. We need to go through all of the data to correlate it." 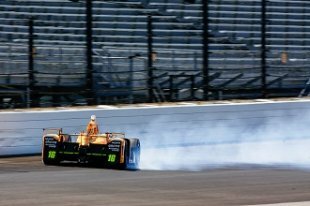 The tire smoke is a significant indicator of IndyCar's progress with its superspeedway safety innovations. During last year's crashes and flights, minimal smoke was present, which indicated the cars had an insufficient amount of downforce while rotating. 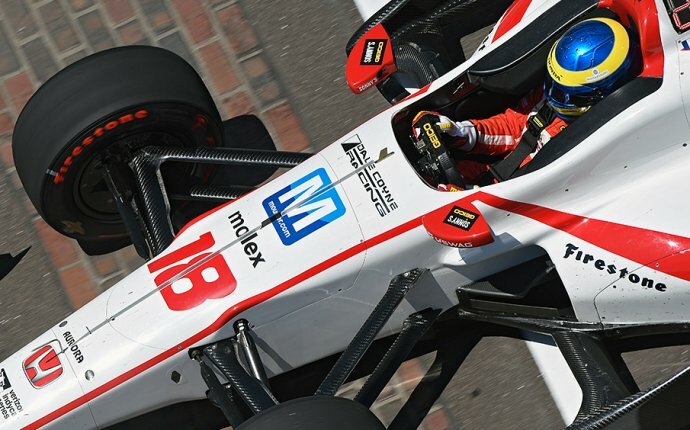 With Pigot's smoky spin, the presence of significant downforce was told by the four Firestones being compressed into the track surface during the slide into the wall. Once the car came to a rest, large holes were found in every tire which, in this instance, was a positive. Belli (left, Marshall Pruett photo) was also pleased to see the early deployment of the beam flaps sooner than anticipated. "You can see the flaps deploy [early] in the spin; in the wind tunnel you almost have to have the car completely backwards before they go vertical, " he said. "But here, you see the [right-rear] flap go vertical while the [right-rear] wheel pod is [blocking most of the rearward air]. That's something interesting we've learned." Another impressive aspect of the crash came when the left-rear wheel pod was mostly destroyed as it made first contact with the wall, but the left-rear flap remained structurally sound and stayed in its upright position. The flap, as Belli showed RACER in photos of the crashed components, did incur some damage, but not enough to stop it from serving its purpose. Adding to list of positive observations, Belli pointed to how Pigot's car reacted after spinning and hitting the wall. Last year, in almost the same exact spot, the noses of those cars were pinned down and the rears got light, which led to the takeoffs. In Pigot's crash, with the new safety devices installed, the rear was pinned, preventing flight. 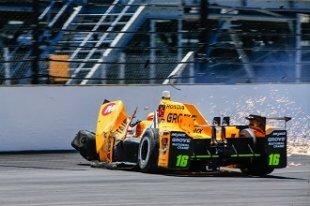 "Last year when we hit the wall, it tended to fall down on the left-front [tire], but in this crash, you can see the back of the car is down, and that's where we think the flaps are pushing down on the back of the car, " Belli added. "It's pretty impressive." Although Belli preferred to keep the speed figure private, he did say the speed of Pigot's impact was reduced by a noticeable amount compared to last year's spins and crashes in Turn 1. Pigot's slower impact – which is favorable – also appears to be a byproduct of the dome skids and beam flaps keeping downforce on the car.